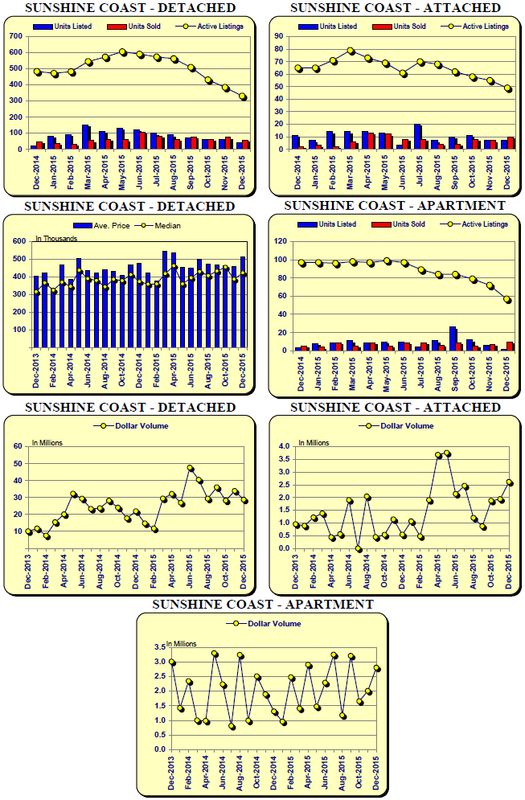 December’s detached, attached, MOP, and lot sales were all on the plus side YOY with attached sales jumping +186% (20 vs 7). 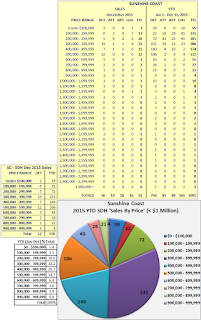 Total YTD attached sales (172) rose an impressive +51% compared to 2014 and +76% compared to 2013. Hmm, where did all those townhome and condo owners go? To detached homes, every one? 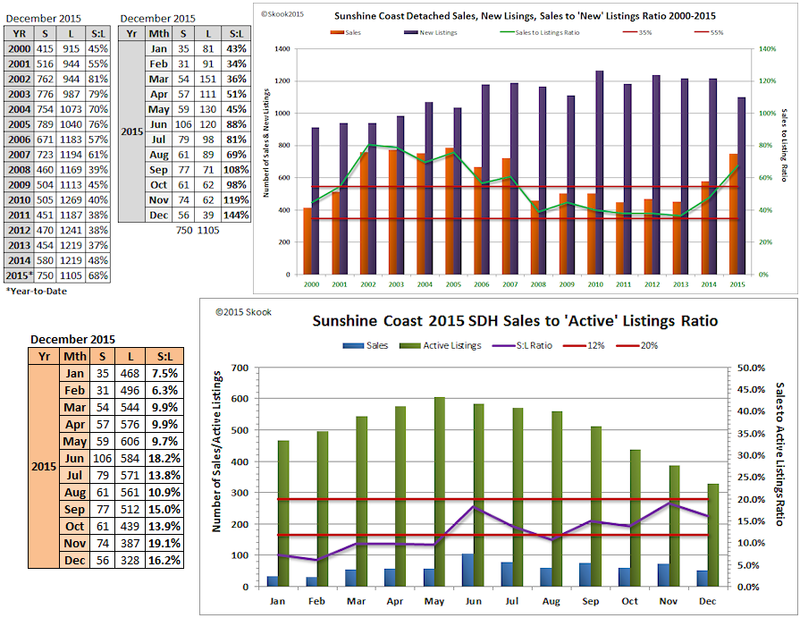 The total sales chart above on the right shows Sunshine Coast real estate sales has risen to new plateaus over the last two years. I see three lower mainland influences behind these sales: boomers/retirees borrowing on/cashing out the equity in their homes and investing in/buying lower priced homes in outlier areas; and falling interest rates and fear-of-missing out, spurring first time buyers into the housing market further afield. I’ve also come across many examples of Generation Y from the both the lower mainland and the Sunshine Coast buying secondary properties as investments and placing them on AirBnB. The Bank of Canada key interest rate stood at 1% for just over five years (Sep 2009 - Dec 2014). On Jan 24, 2015, the Bank of Canada dropped its rate 25 basis points to 0.75% and mortgage rates followed suit. Barely six months later on Jun 15th, the BoC dropped the rate another 25 basis point to 0.50% and the partying began in earnest. Yep, nice chart. 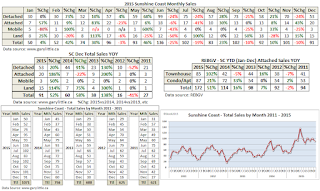 All five market areas of the SC saw year-to-date total sales rise anywhere from +31% in Halfmoon Bay to +54% in Pender Harbour – finally giving Pender something to brag about after years of languishing sales and falling prices. 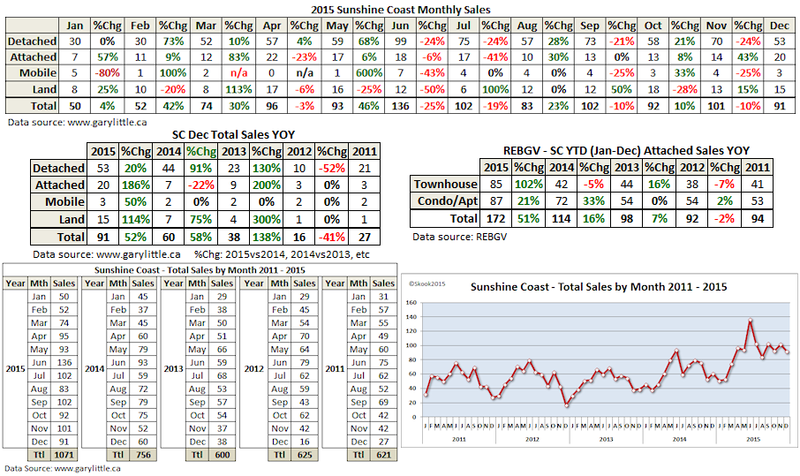 My total SC sales are pegged at 1069; however, that’s 2 sales less than SC Realtor® Gary Little and the REBGV with both coming in at 1071 (excluding Gambier & Keats Islands’ 20 combined sales of 7 single detached + 13 lots). 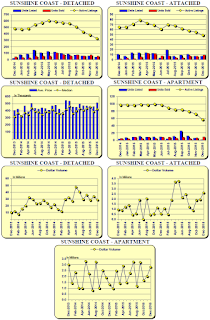 December detached sales hit a new twelve year record only two short of the all-time high of 58 set back in 2003. You can wade through the table data without further comment from me. The majority of detached sales occurred in the $300,000-$399,999 range (32.2%) followed by $400,000-$499,999 (20.7%), $500,000-$599,999 (14.7%) and $200,000-$299,999 (10.0%). 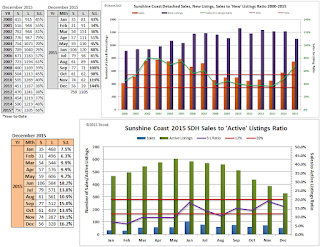 I pulled together the year-end detached sales data for 2013 to 2015 and you can see a definite shift into the higher price ranges by 2015. The reasons being by 2015 lower priced stock has been snapped up; lower interest rates mean cheaper mortgages and buyers can afford to buy “more” house; and, lower mainlanders cashing out have become millionaires and SC high priced homes are considered a bargain. Of course as home sales gathered steam in 2014 and 2015, inventory (supply) dropped forcing prices to rise (scarcity) which in turn forced buyers (demand) into higher price ranges whether they sought it or not. 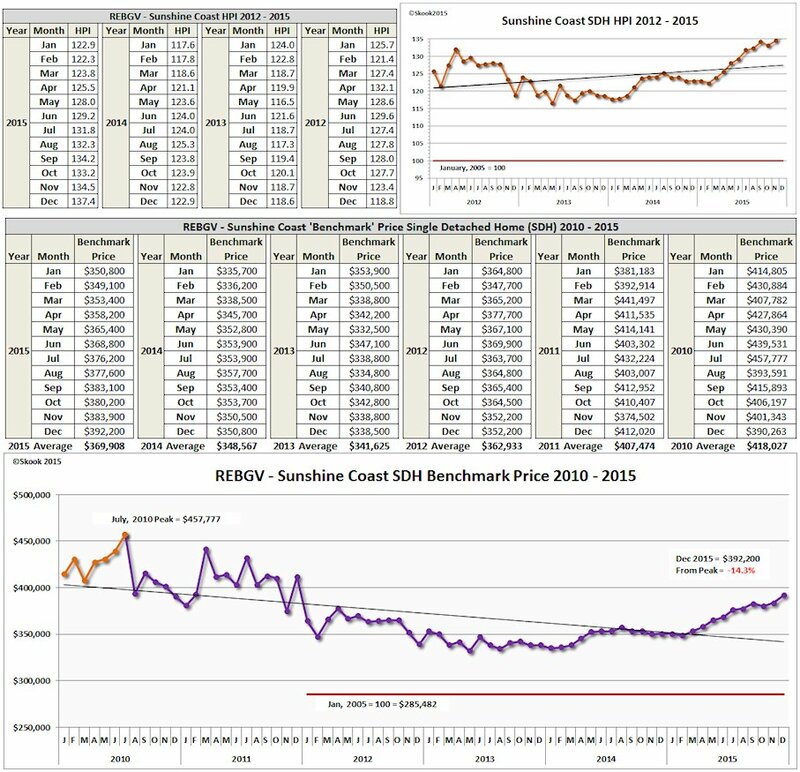 I explained in my earlier posts at VancouverPeak.com that the REBGV includes single detached, Manufactured on Pad (MOP) and ‘$1mill+’ property sales together in its Median Sales Price figure found on page 6 (MLS® Sales Facts) in its monthly stats package. 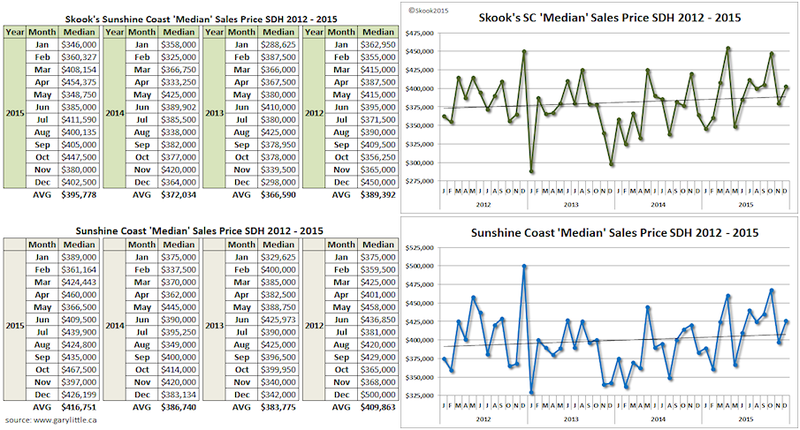 SC Realtor® Gary Little removes MOP sales from his detached Median Sales Price. 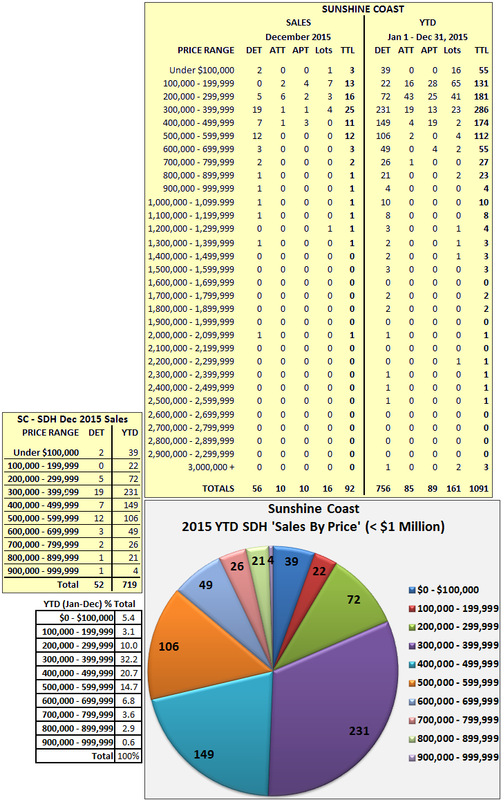 And, I think they are both wrong to include ‘$1mill+’ sales because though few in number those sales distort the Median Sales Price the size of the Sunshine Coast (the Average Sales Price is especially susceptible to this distortion). 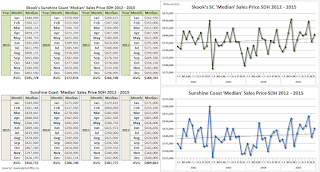 So, I decided to recalculate the Median Sales Price by removing those ‘$1mill+’ property sales (I keep MOP sales) and the results are directly below in the top table and chart. They are followed by Little’s data for comparison. What we both have in common, though, is a rising trend line which started its angle up in September. 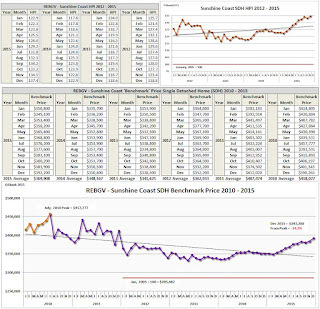 The MLS® Home Price Index and Benchmark Sales Price both as expected show the SC market trending upwards. The BSP ended the year at $392,200. This is -14.3% below the July 2010 Peak Benchmark Price of $457,777. The BSP began the year at -23.4% below Peak. The second ratio is used on page 7 that gives MLS® Listings Facts for each of the Board’s market areas. In both instances, sales are divided by listings to obtain a ratio percentage that is then used to tell the public a market’s status: is it a seller’s, balanced or buyer’s market. 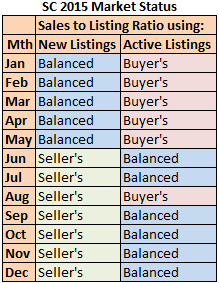 My ‘Sales-to-New Listings’ Ratio chart directly below shows the year’s path; however, if we look at the December 2015 table to its left, we see that the first five months were each “Balanced” Markets (between 35% and 55%) and the remaining seven months were each” Seller’s” Markets (above 55%). However, if we turn to the ‘Sales-to-Active’ Ratio the picture is different. The first five months and August were “Buyer’s” Markets (below 12%) and the other seven months were each “Balanced” Markets (between 12% and 20%). This next table helps illustrate what I’ve described above. So, we’re talking apples and oranges here and with a bit of magic are told they both morph into bananas. And to really mess things up, we told there’s third way to get bananas using grapefruit - “Months of Inventory” (MOI). I’m not going to elaborate further on this conundrum - I will save that for a later post which I’m working on (lots of balls in the air). I’m going to end with the Great Oracle's SC charts and draw your attention to the huge drop in Active Listings by the end of year. This will have a substantial role to play going into 2016.